Here are a few updates on HPE OneView since the original blog was posted in 2015. Scope based access control: Extended role based access control to allow authenticated user to view/modify/control a subset of system resources. Additional certificate management features: Extended certificate management capabilities to include support for CA signed certs for iLOs, Onboard Administrators, proxies, etc. SNMPv3: Previous OneView version used SNMPv1. SNMPv1 is preserved for backward compatibility. At Hewlett Packard Enterprise Discover Las Vegas 2015, OneView 2.0, the newest version of HPE’s infrastructure management solution was announced. It became available for download in September 2015. In this post, Senior Solution Architect, Ryan Ollenburger shares the benefits of this platform’s unified management tools such as its new addition of server profile templates and additional storage provisioning capabilities. 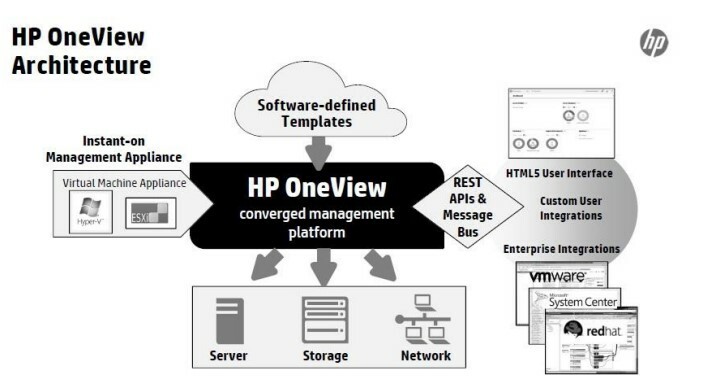 The primary vision of OneView has been to consolidate capabilities found in several HPE infrastructure management solutions (HP-SIM, Insight Control and VCEM-Virtual Connect Enterprise Manager) into one pane of glass. This consolidation helps automate and streamline processes used to manage infrastructure as it becomes more “converged.” OneView 2.0 runs as a vSphere or MS HyperV appliance. Automated execution of firmware and OS Driver updates via HP Smart Update Tools for Windows or Linux. Firmware and OS Driver updates can be updated on a server while the OS is running. The updates will be staged and then OneView will prompt you to reboot the server. This reduces the time that the server needs to be offline during an update process. Before this enhancement, a server had to be taken offline to update its firmware. This list may not look revolutionary, but the biggest takeaway from the OneView 2.0 release is the ability to provision infrastructure, specifically blades, including network and storage connectivity in minutes as opposed to hours. Finally, the ease of ongoing firmware and driver management reduces future hours spent at the keyboard, allowing us to spend more time working on projects that are more valuable to the business.